In the 1980s there were fifty courses training professional studio potters, now there are ten. In this film, a group of Britain’s leading potters make the case for Clay College Stoke, a new training initiative to pass on practical skills of a high standard to a new generation. They are Lisa Hammond, Matthew Blakely, Kevin Millward, Kate Malone and Shozo Michikawa, potters of international renown. I went to Harrow, the University of Westminster, and I got a ceramics degree from the most prestigious course in Britain, but I wish I’d had the sort of training they’re offering. I’d retired from salaried employment and, after a lifetime’s passion for ceramics, was flattered to be accepted on the course. I’d spent years in evening classes and alone trying to develop my skills – a difficult task when you’re struggling with a problem and no-one can show you how to solve it. My experience of part-time courses was that, however much they welcome advanced students, most are for beginners. I decided that if I was to progress I had to do a degree. I’d met several art students who told me they got neither studio space nor adequate teaching on their BA courses. Harrow was different. The long-established ceramics course had honed instruction to a sharp edge and the studio faculties were excellent. There was a large throwing room. The kiln room had a wide range of electric and gas kilns and there was a kiln site (unique in UK universities) where students learned to build and fire flame-burning kilns. There were well-stocked wet-glaze and dry-glaze rooms. Second and third year students had their own spaces and first year students shared a large studio. There was access to studios and workshops in other departments, especially plaster room, wood and metal workshops and print studio. In some ways being an experienced maker put me at disadvantage at Harrow because it’s easier to learn than re-learn. I wasn’t allowed to coast until the less experienced students caught up: the pressure was just as intense and I had to go further, throw looser and make bigger. Our throwing tutors, Richard Phethean and Carina Ciscato, are accomplished and make very different types of work. Richard’s is robust, slip-decorated earthenware and Carina’s is delicate porcelain. Being taught by different throwers, who approached nearly everything differently, was valuable, impressing on us that there are useful methods but no right answers. Two sessions with the late Simon Carroll – the wildest thrower I had ever seen – was liberating for everyone. And the input of a handbuilder, Sarah Scampton, also provided a valuable perspective. The teaching developed your creativity and gave you a good technical foundation. I enjoyed Daphne Carnegy’s workshops in ceramic chemistry and technology, I still consult her notes and my glaze is based on her recipe. We spent mornings in the lecture room and afternoons in the glaze room, ending the year with a themed series of glaze or clay trials and a long analytic report. Mine was about tin-glaze at stoneware temperatures, exploiting the gradient kiln to find a good recipe and testing dozens of oxide combination for in-glaze colours. Other students worked on topics including shino glazes, Egyptian paste, printed surfaces, paper clay and engobes. Hand building was new to me. Steve Buck was an encouraging and challenging teacher, introducing all hand-building techniques, including mould making with Claire Twomey. Students were given freedom to develop their projects, but under constant questioning. Reflective and critical practice was the heart of the course. It could be unsettling after a day’s happy work to be asked by Steve, “Why are you doing that? Why didn’t you do this instead?” The point was to make you think, to explain your work fully, to relate it to your sketchbooks and to put it in context, including the context of non-ceramic art. 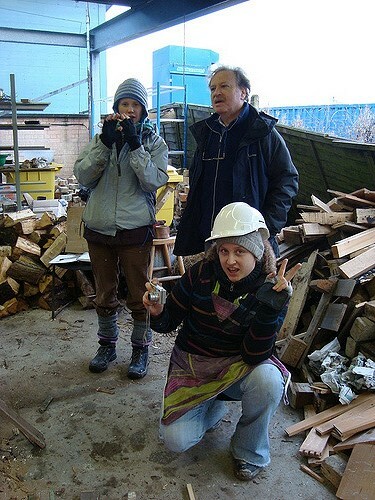 With Nigel Wood we spent a term on the kiln site, with hard hats and steel-toed boots, building a large wood-fired kiln to our own design – my team put up a double-chambered kiln for salt in one side but not in the other. The work was demanding and Harrow students had to be dedicated. In my last years in salaried employment I was working thirty sedentary hours a week. At Harrow I was working up to seventy a week, most of it on my feet. Then the art school burned down. 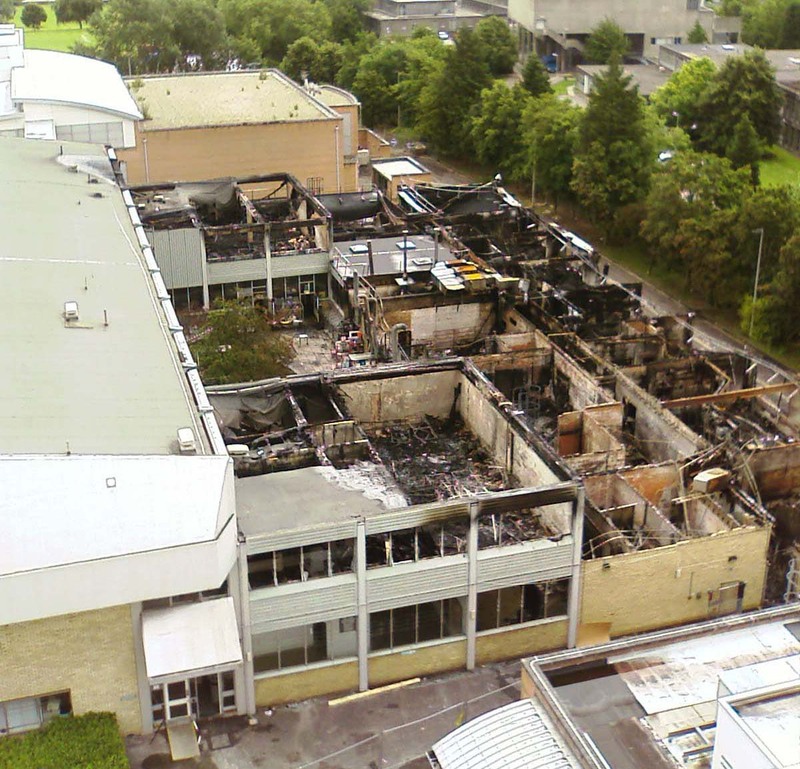 Students and staff were shocked one summer morning to find that a fire had destroyed most of our department overnight. The blaze damaged the kiln room and some of the studios and the fine art and fashion departments. About twenty engines and a hundred fire fighters attended the fire. From the ruins of the studios a fire fighter rescued a sculpture of a boy angel by third-year ceramics student Claire Palfreyman. It was one of several third-year works to be exhibited at the New Designers show soon after. Other exhibition pieces were retrieved later. “The angel is a marvellous omen for us,” said ceramics course leader Kyra Kane. “We are determined that the world-renowned ceramics department at Harrow will continue to flourish despite this setback. And this statue represents all the spirit, talent and inventiveness that will ensure our future.” The University responded quickly and all courses were run in temporary buildings the following year. But although the fire didn’t destroy the course, the accountants did. The bean-counters said the university couldn’t afford it. The equipment was too expensive. It took up too much space. There weren’t enough students. In our meetings with the dean we said that this was the best course in the country, that we were getting visits from universities all over the world, that we had produced some of the most eminent potters in Britain – but in reply we were shown spreadsheets that compared cost per square foot per student per course, and we came out higher than computer animation. The course was allowed to run till 2013 and then closed its doors. Other good ceramics courses in universities followed. They were short-sighted decisions and I believe they were wrong, and so I welcome Clay College Stoke. I said I wish I’d had the sort of training they’re offering. After my enthusiastic praise for the Harrow course you may wonder why I say that. The ceramics course at Harrow was a fine-art course in clay. What I’ve described accounted for half of it. Although it was hands-on, we were expected to spout artbollocks. Although basic methods were taught in the first year, the course was down on craft. Most students graduated without being able to throw on the wheel. So I raise my glass to Lisa, Matthew, Kevin, Kate and Shozo, and I praise them for going to Stoke, the heart of British pottery. But I don’t agree with everything they say. They say the master potters are getting old and that there’s a danger that their skills will die out. But I notice that there are more studio potters than ever before. When I first got interested in the craft there were a couple of hundred. Now there are thousands. Kevin Millward says that there’s a demand for hand-made pottery that can’t be met – but few potters can make a living from it. When I sell at ceramics fairs, the destination for serious collectors, I like to chat to the other exhibitors, and in the last year I’ve noticed that most are unhappy about sales. Perhaps I suffer from the disadvantage that my salaried employment taught me about business, marketing and accounting. There are only a few potters who can’t keep up with demand and most need to sell more. Crafts shops and galleries are struggling too, and several that I supplied have closed over the years. We don’t have a shortage of potters, we have a shortage of customers. So, three cheers for Clay College Stoke – but let’s have more input into sales and marketing too.